Just in time for gift giving! Show him how much he means to you with a gift layered in genuine 18K gold or treat yourself to this great deal! This men's Cuban style 18K necklace and bracelet set offers timeless styling and a look that says "Success!" 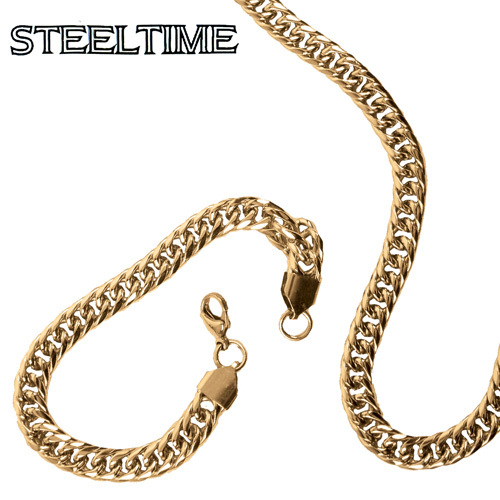 Available in one of the most popular chain styles of all time, they are both crafted from durable stainless steel that was painstakingly layered with luxurious IP 18K gold that's hypo allergenic and tarnish resistant. Set includes a 24" necklace and a matching 8.5" bracelet. Both have lobster-claw clasps for security. 1-year limited warranty.